Ursa Minor constellation lies in the northern sky. The constellation’s name means “the smaller bear,” or “the lesser bear,” in Latin. The Great Bear constellation is represented by its larger neighbor Ursa Major. Ursa Minor was first catalogued by the Greek astronomer Ptolemy in the 2nd century. It is easy to recognize because it contains the famous Little Dipper asterism. Ursa Minor is also notable for marking the location of the north celestial pole, as it is home to Polaris, the North Star, which is located at the end of the dipper’s handle. The constellation is believed to have been created by Thales of Miletus, a philosopher and astronomer who lived between 625 and 545 BC and was known as one of the Seven Sages of Greece (early 6th century philosophers known for their wisdom). It is also possible that Thales merely introduced the constellation to the Greeks. He was believed to be descended from a Phoenician family, and Phoenicians frequently used Ursa Minor in navigation because, lying so close to the North Pole, the constellation was an excellent guide to true north. The Greeks sometimes called the constellation the Phoenician. Before it became known as the Little Bear (Μικρὰ Ἄρκτος), Ursa Minor was known as Dog’s Tail, or Cynosura (originally Κυνόσουρα in Greek). 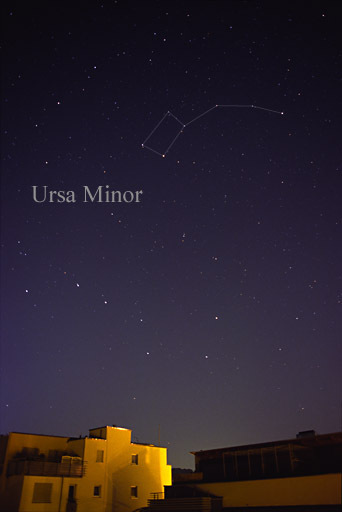 Ursa Minor is the 56th constellation in size, occupying an area of 256 square degrees. It is located in the third quadrant of the northern hemisphere (NQ3) and can be seen at latitudes between +90° and -10°. The neighboring constellations are Camelopardalis, Cepheus and Draco. Ursa Minor belongs to the Ursa Major family of constellations, along with Coma Berenices, Boötes, Camelopardalis, Canes Venatici, Corona Borealis, Draco, Leo Minor, Lynx, and Ursa Major. Ursa Minor contains one star with a confirmed planet and has no Messier objects. The brightest star in the constellation is Polaris, the North Star (Alpha Ursae Minoris), with an apparent magnitude of 1.97. There is one meteor shower associated with the constellation: the Ursids. Ursa Minor is usually associated with two different myths. In one, the constellation represents Ida, the nymph who took care of Zeus on the island of Crete when he was small, along with Adrasteia, the nymph represented by the larger constellation Ursa Major. Zeus’ mother Rhea hid Zeus on the island when he was very young to protect him from his father Cronus. Cronus, fearful of an old prophecy that said that one of his children would overthrow him, swallowed five of his children after they were born. When Zeus was born, Rhea tricked Cronus into swallowing a stone instead, and Zeus eventually fulfilled the prophecy. He freed his brothers Poseidon and Hades and sisters Hera, Hestia and Demeter, and became the supreme god of the Olympians. In a different myth, the constellation represents Arcas, son of Zeus and the nymph Callisto. Callisto had sworn a vow of chastity to Artemis, but was later unable to resist Zeus’ advances and the two had a child, Arcas. When Zeus’ wife Hera found out about the betrayal and the child, she turned the nymph into a bear. Callisto spent the next 15 years wandering in the woods and avoiding hunters. One day, she came face to face with her son. Scared, Arcas drew a spear, ready to kill the bear. Luckily, Zeus saw the scene and intervened before it was too late. He sent a whirlwind that scooped the mother and son up to the heavens, where Callisto became Ursa Major and Arcas, Ursa Minor. Arcas, however, is more frequently associated with the constellation Boötes, the herdsman. In a slightly different version of the myth, it is the goddess Artemis who turns Callisto into a bear for breaking her chastity vow. In an older myth, the seven stars that form the Little Dipper were said to represent the Hesperides, seven daughters of Atlas, who tended to Hera’s orchard (Garden of the Hesperides) where a tree of golden, immortality-giving apples grew. The stars that form the Little Dipper asterism are Polaris (Alpha Ursae Minoris), Yildun (Delta Ursae Minoris), Epsilon Ursae Minoris, Anwar al Farkadain (Eta Ursae Minoris), Akhfa al Farkadain (Zeta Ursae Minoris), Pherkad (Gamma Ursae Minoris), and Kochab (Beta Ursae Minoris). Polaris, the closest bright star to the north celestial pole since the High Middle Ages, is the brightest star in Ursa Minor. It has an apparent magnitude of 1.985 and belongs to the spectral class F7:Ib-II. The star is approximately 434 light years distant from Earth. The easiest way to find Polaris in the night sky is to follow Dubhe and Merak, the two bright stars at the end of the Big Dipper asterism in Ursa Major, upwards and then look for the nearest bright star. Alpha Ursae Minoris is actually a multiple star, consisting of the bright giant Alpha Ursae Minoris A, two smaller and dimmer companion stars Alpha UMi B and Alpha UMi Ab, and two more distant stars, Alpha UMi C and Alpha UMi D.
The brightest component in the Alpha UMi system is a bright giant (II) or supergiant (Ib) star belonging to the spectral class F8. It has a mass six times that of the Sun. Alpha UMi B, or Polaris B, discovered by William Herschel in 1780, is a main sequence star of the spectral type F3, and Alpha UMi Ab is a dwarf star in a very close orbit. Polaris is classified as a Population I Cepheid variable. The star’s variability was confirmed in 1911 by the Danish astronomer Ejnar Hertzsprung. When Ptolemy observed Polaris, it was a third magnitude star, but today it is 2.5 brighter, having changed to its current second magnitude in the meantime. Because of its brightness and proximity to the pole, Polaris is an important star in celestial navigation and has been known by many different names, including Stella Maris (sea star), Alruccabah, Phoenice, Lodestar (guiding star, derived from the Old Norse leiðarstjarna), Cynosūra (from the Greek κυνόσουρα, meaning “the dog’s tail”), Angel Stern, Star of Arcady, Yilduz, Mismar (needle or nail), Tramontana, Navigatoria and Pole Star. Beta Ursae Minoris is a giant star belonging to the spectral type K4 III. It has a visual magnitude of 2.08 and is 130.9 light years distant from the solar system. It is the brightest star in the bowl of the Little Dipper. Kochab and Pherkad, Gamma Ursae Minoris, are sometimes called the Guardians of the Pole because they appear to be rotating around Polaris. From 1500 BC to 500 AD, the two stars served as twin pole stars, being the closest bright stars to the north celestial pole. Neither of the two, however, was as close to the pole as Polaris currently is. Kochab is 130 times more luminous than the Sun and has about 2.2 solar masses. Gamma Ursae Minoris is an A-type star with an apparent magnitude of 3.05, approximately 487 light years distant. It has the stellar classification A3 lab, which means that it is an intermediate luminosity supergiant. It is a very fast rotating star, with a rotational velocity estimated at 180 kilometres per second. Its radius is 15 times solar and it is 1,100 times more luminous than the Sun. Gamma Ursae Minoris is classified as a shell star, one that has a disk of gas surrounding its equator which causes variations in the star’s magnitude. Delta Ursae Minoris is a white main sequence dwarf of the spectral type A1V, approximately 183 light years from Earth. It has a visual magnitude of 4.35. The star’s traditional name, Yildun, comes from the Turkish word for “star,” yıldız. The name is sometimes also spelled Vildiur, Jildun, Yilduz and Gildun. Zeta Ursae Minoris is a main sequence dwarf belonging to the spectral type A3Vn. It is in fact on the verge of becoming a giant star, with 3.4 times the mass of the Sun, 200 times the luminosity, and a surface temperature of 8,700 kelvins. Zeta Ursae Minoris is also classified as a suspected Delta Scuti variable. Zeta Ursae Minoris has a visual magnitude of 4.32 and is 380 light years distant. Eta Ursae Minoris is a yellow-white main sequence dwarf star belonging to the spectral class F5 V. It is 97.3 light years distant from Earth and has a visual magnitude of 4.95. It is visible to the naked eye. Epsilon Ursae Minoris is a triple star system consisting of Epsilon Ursae Minoris A, a yellow G-type giant which is also classified as an eclipsing spectroscopic binary star, and another component, the 11th magnitude star Epsilon Ursae Minoris B, which is orbiting the primary binary star system from a distance of 77 arc seconds. Epsilon Ursae Minoris A is also classified as an RS Canum Venaticorum type variable star. The luminosity of the binary system changes as a result of the components eclipsing each other, and the overall brightness varies from magnitude 4.19 to 4.23 with a period of 39.48 days. Epsilon Ursae Minoris is approximately 347 light years distant from Earth. The Ursa Minor Dwarf is a dwarf elliptical galaxy in Ursa Minor. It has an apparent magnitude of 11.9 and is approximately 200,000 light years distant. It is a satellite galaxy to the Milky Way. Most stars in the Ursa Minor Dwarf are old and there is little to no star forming activity going on in the galaxy. The Ursa Minor Dwarf galaxy was first discovered by A.G. Wilson at the Lowell Observatory in 1954. Information provided by the Hubble Space Telescope in 1999 confirmed that the galaxy had a two billion years long period of star formation about 11 billion years ago and a straight forward evolution since.